This year turned into a year of bird photography. It started back in March when I was watching a couple dogs. I was flipping through Instagram, and came across a post from Celestron about their C5 spotting scope. The post sparked my interest as a new piece of photographic equipment. It only took a day or two of pondering, then I ordered one of the scopes. 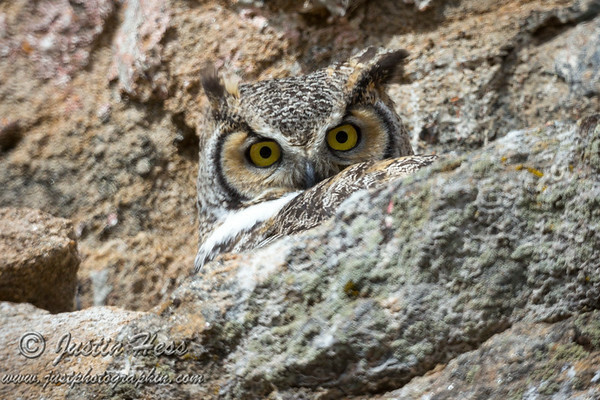 Around the same time, a pair of Great Horned Owls returned to one of their favorite nesting sites nearby. This led to the first opportunity for shooting photographs through the scope. I was pleased with the results. The mother owl on the nest. 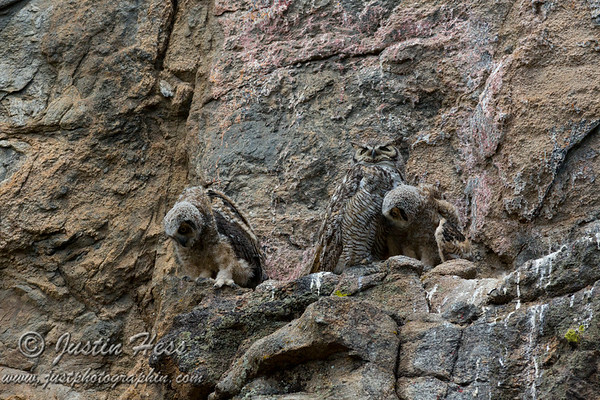 The two immature owls before they fledged (they were testing their wings in preparation to fledge). Being that spring is when many birds return from their winter sites, I began siting more birds. The past few years, there has been a pesky male Northern Flicker around the house. Part of their mating ritual includes the male beating on anything that sends out a noise to attract attention to itself. This often roused me earlier than I wanted to wake up, and I would run out with a tennis ball to chase the bird off the metal roof vents. Scare tape was also installed and effective. 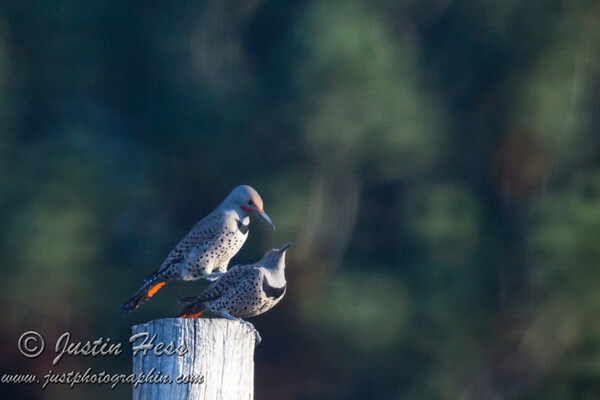 The male Northern Flicker courting a female. The Mountain Bluebirds also arrive in April, and quickly claimed one of the birdhouses as their nesting location. They were really fun to observe. The swallows arrived slightly later, and there were some battles as the swallows tried to force their way into the already-claimed birdhouse. 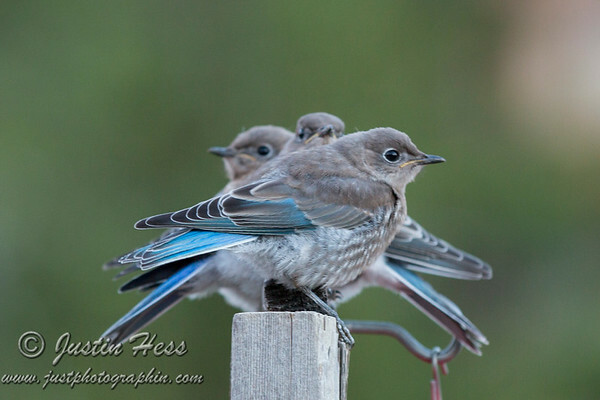 The bluebirds prevailed, and raised a brood of fledglings that are still around the area. 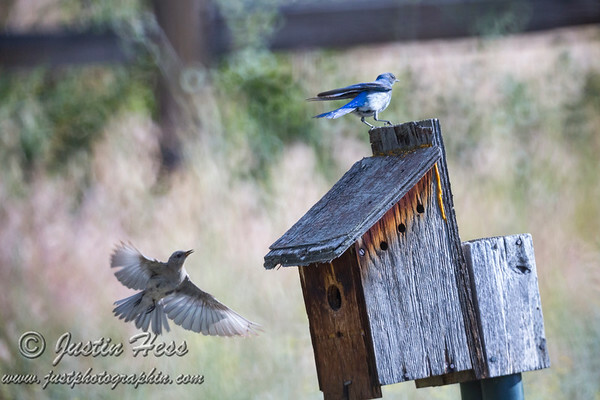 The adult male and female bluebirds tending to their young in the birdhouse. 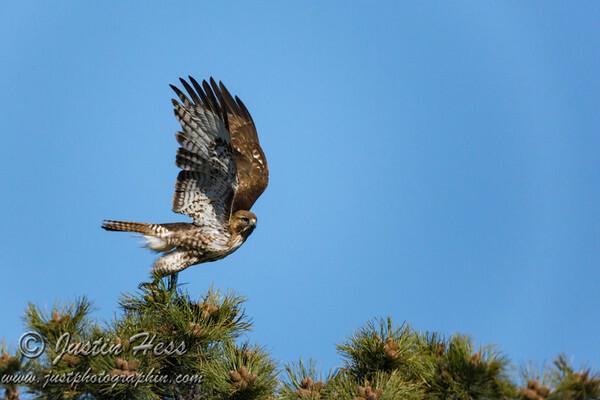 A Red-tailed Hawk has frequented the area for several years. It has been a challenge to capture a decent takeoff photo. This year, I managed to capture a decent shot. There were also a few new birds around the neighborhood (or at least I had never observed them/IDed them before). This included: Yellow-rumped Warblers, White-crowned Sparrows, and a Western Tanager. I had seen a Western Tanager in the area, but never in the yard. The White-crowned Sparrow created a challenge as I was trying to capture a video of it singing its song. It would fly away before I could manage to hit record. 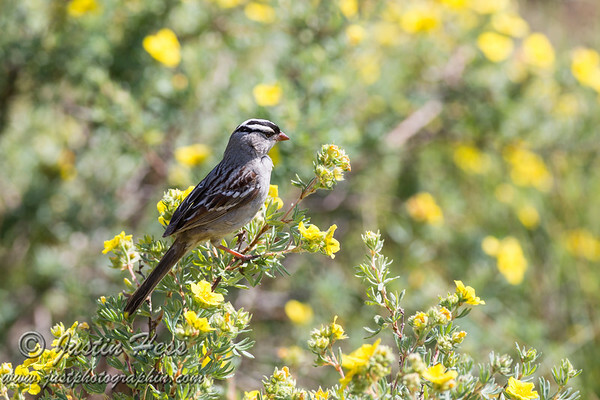 The male White-crowned Sparrow hunting for food in potentilla bushes. I have also spotted a few of the regular bird species: American Robins, Pine Siskins, Pygmy Nuthatches, Mountain Chickadees, Red-breasted Nuthatches, Downy Woodpeckers, Steller’s Jays, Broad-tailed Hummingbirds, Rufous Hummingbirds, House Finches, Tree Swallows, Common Ravens, American Crows, Morning Doves, Black-billed Magpies, House Wrens, etc. Needless to say, 2017 turned into a year of birds.